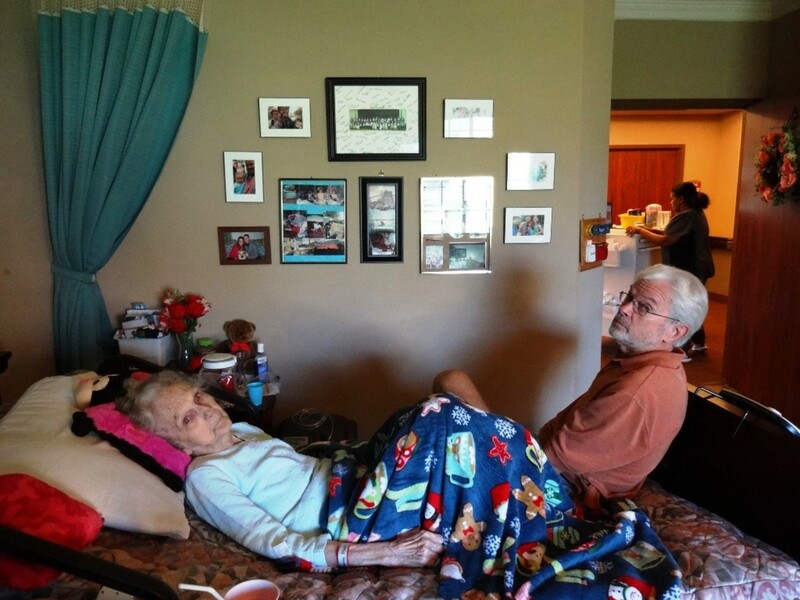 Peg served as caregiver and patient advocate for family members over the past dozen years. What Do Nursing Home Residents Want? 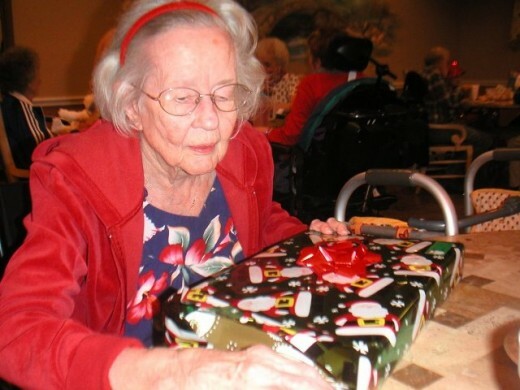 What many nursing home residents like more than anything else is the gift of the time you spend with them. Your presence makes them feel special and valued. But when long distances or work schedules prevent you from visiting loved ones often, a thoughtful and useful gift is the next best thing. The question is what do they want or need that they don't already have? 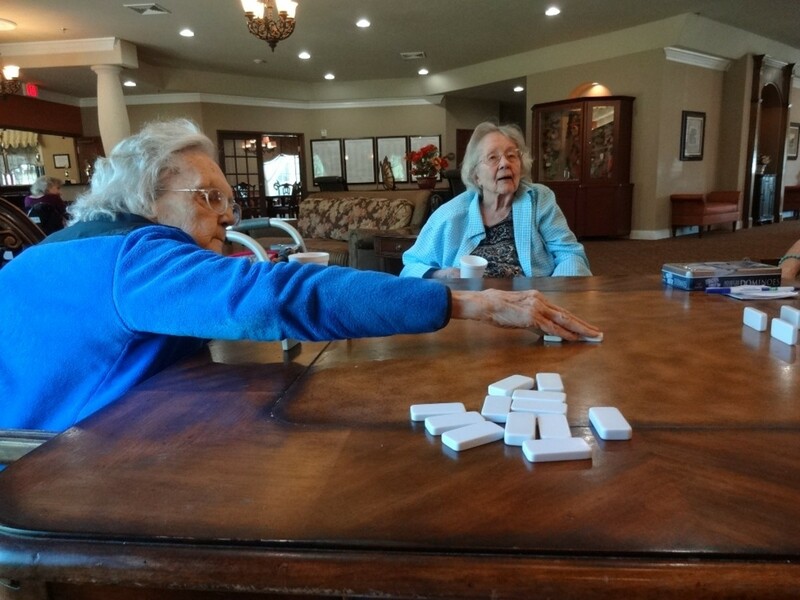 Residents frequently request games that stimulate their mind to help them remember they're still in the game. A set of Dominoes or mind challenging games like Scrabble, jigsaw puzzles, crossword puzzles, adult coloring books, and card games like Rummy and Go Fish are popular with seniors. 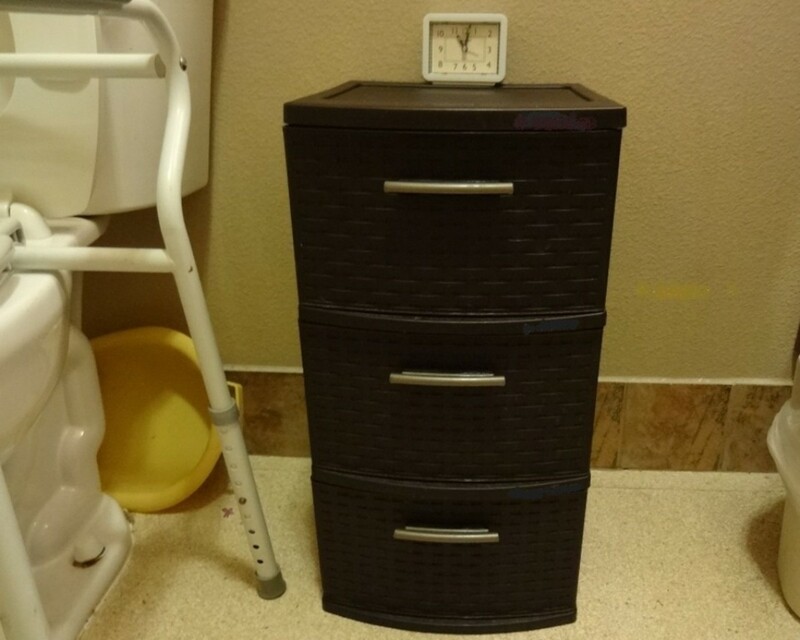 One common issue in a skilled nursing facility is patients forgetting ordinary things. It's common to hear a resident say, "I can't find my room." This colorful door decoration makes a great gift for residents trying to find their room in a hallway of similar doors. On her 90th birthday this resident's children, grandchildren and great grandchildren came from around the world to celebrate the event. A photo book labeled with everyone's names helps her remember family members. Photos can help ease the loneliness of separation from family for those confined to a nursing home. When names become a blur, a photo collection of the patient's family members may help. Space in a resident's room is limited. Counter tops are often filled with medical equipment, cosmetics, books and other things leaving little room for framed photos or other keepsakes. Using the wall space to display framed photos of loved ones, pennants from favorite teams and other memorabilia is the way to go. This photo arrangement was a gift from the resident's son who gathered up-to-date photos from each of his children with their kids, put them together in matching frames and artfully hung them on the wall where Great-grandmother could see them every day. When the days become a blur as time passes, residents enjoy having a visible way to help them keep up with the day and date. 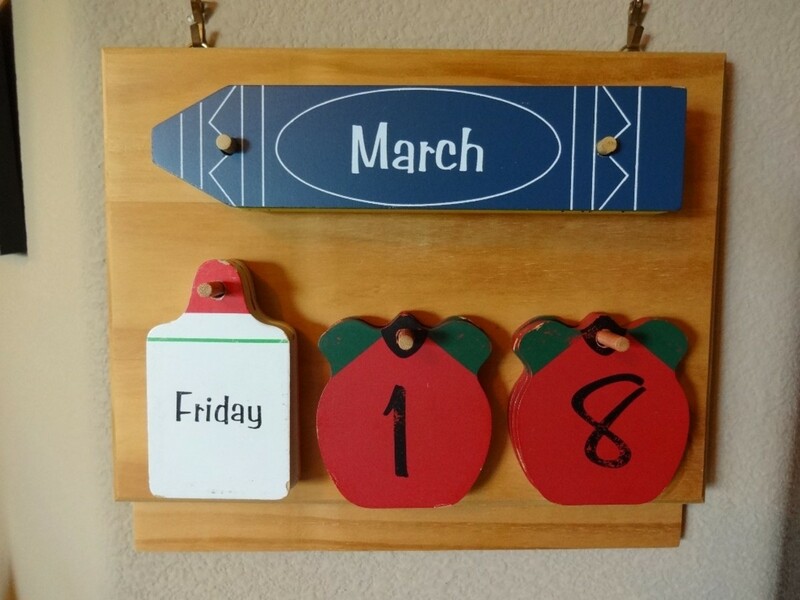 The changeable calendar pictured above comes with removable wood planks with writing on both sides. There are additional planks for special events like holidays and birthdays. This would be a great project for a student or crafty person to make or purchase them ready-made online. Seniors tend to get cold easily in common areas of the facility. A lightweight jacket to match an outfit is always welcomed. Temperature is adjustable in a private room but the common rooms and hallways can be uncomfortably cold for some seniors. While everyone else may be wearing shorts, Grandma is usually wearing a jacket. A lightweight jacket with a zipper, rather than difficult to fasten buttons, makes a great gift that can be worn year around. This machine washable jacket is a favorite that Aunt Louise wears often. Finding suitable clothing for folks of a certain age can be difficult. 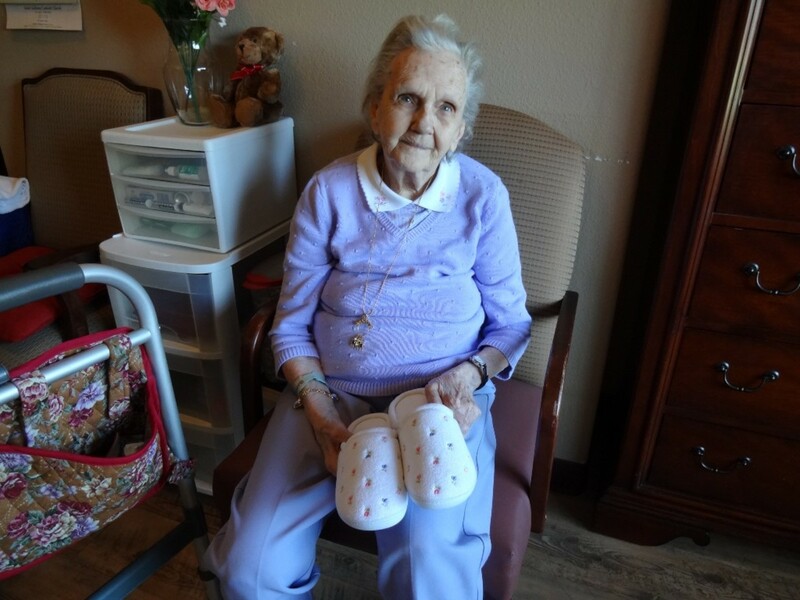 When Aunt Louise first entered the skilled nursing facility at ninety-four, she was wearing pull on tops with matching pants. Once she became wheelchair bound, she was less able to stand up without holding onto the handrail. That made dressing in pants difficult. Seniors are particular about the styles of clothes they like. Louise prefers a modest neckline that slips on over her head, with no buttons to fasten and with side pockets. The dresses need to hold up to frequent washings. We found quality dresses at The Vermont Country Store online and ordered several of the same style in different colors. She was delighted. House slippers are welcomed gifts. Make sure they have rubber soles to help prevent falls. Wondering about other items that your senior may need? 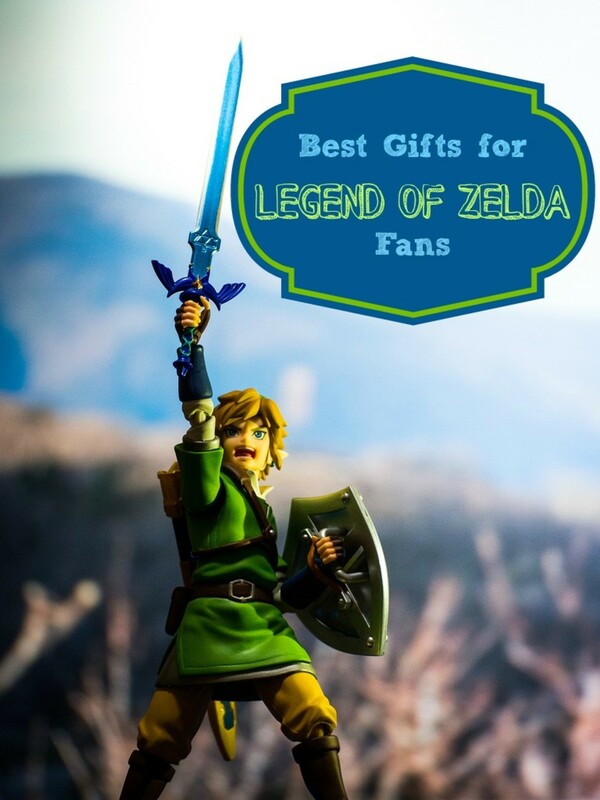 These are a few suggestions for low-cost, useful gift items. House slippers are easier for arthritic hands to slip on. Marking pens to label clothing and personal items. Quality hair brushes and combs are misplaced often and needed every day. Bendy straws make drinking easier for the bed-ridden patient. Seat cushions for dining room chairs are helpful for slender, tender bums. An eyeglass tether for around the neck helps keep track of reading glasses. Boost or Ensure helps the residents to get the proper nutrition when their appetite diminishes. A laundry basket is useful to store dirty clothing prior to wash day. A large-number telephone makes dialing easier for those with vision issues. Plastic cabinets from the Dollar Store supplement the limited drawer space. Extra drawer space is always welcomed and this set of plastic drawers comes in handy in the bathroom. Drawer space is at a premium in the facility where my mother lives. The built in chest only has five drawers to hold all of her clothing and personal items. The night stand has two smaller drawers for odds and ends like jewelry, hair brushes and assorted personal items. Adding a plastic set of drawers in the bathroom allows space for personal wipes, hand towels, toothpaste, denture cups, and shampoo. Chris Lemoine visits the nursing facility every week to sing for the residents. 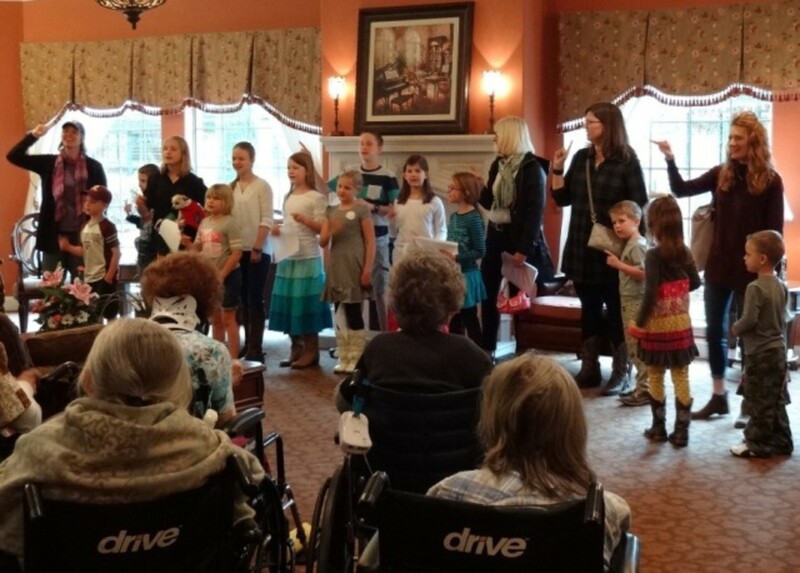 Talented musicians share their time and gifts with the residents. A compassionate entertainer, Chris Lemoine remembers the names of those in his audience and caters his music selections to match their memories. He listens to their requests and learns new tunes from their feedback. 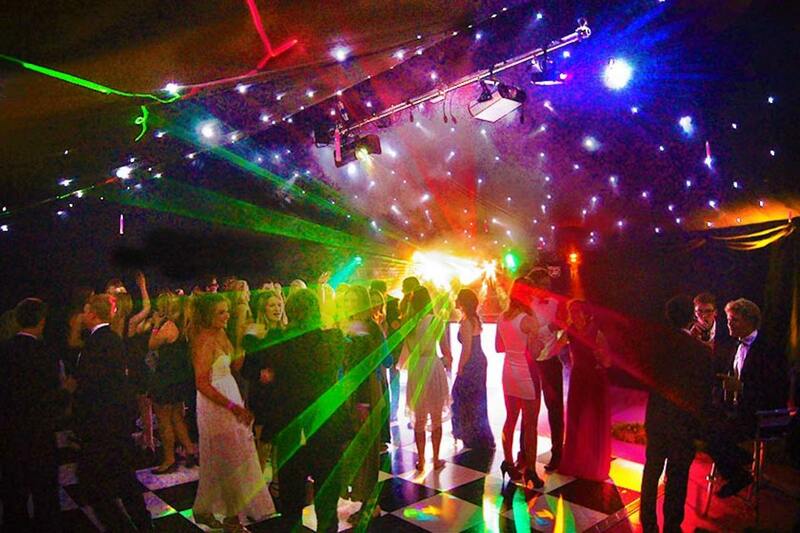 Songs from their particular era tend to engage the listener and encourages participation in the musical event. 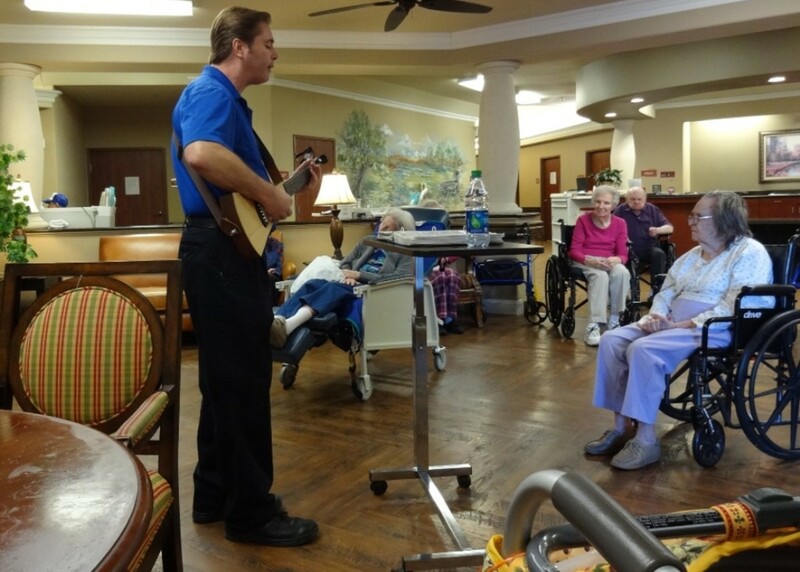 If you can play an instrument or sing along with Karaoke music, the residents will always gather to listen. Or volunteer to read stories aloud to the residents individually or in a group. 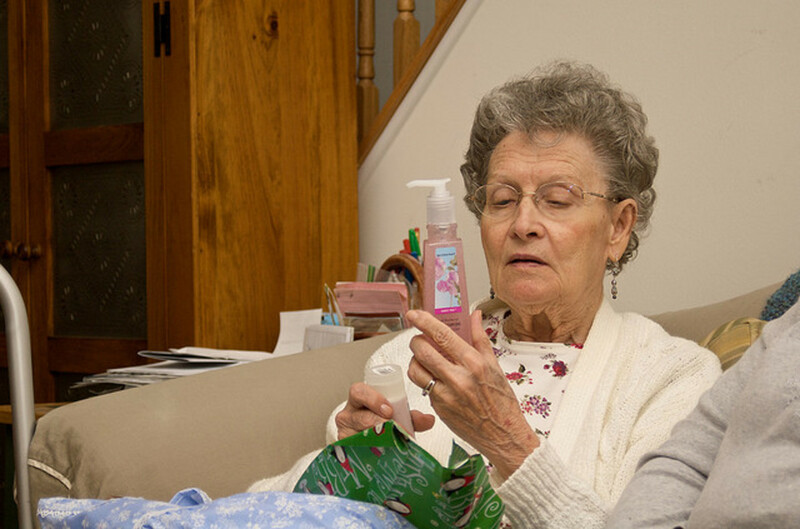 If you have the time and know how to sew, you can create a personalized gift for your loved one who uses a walker. This handmade pocketed walker fabric basket is a great way to carry around items like small notebooks, pencils, pens, and eyeglasses while using both hands to safely navigate. Follow the link for instructions on how to make this item. Seniors benefit from daily exercise to boost morale, increase muscle mass and improve circulation. This video shows how the residents keep the seniors actively engaged in using their hand and eye coordination as well as their upper bodies. 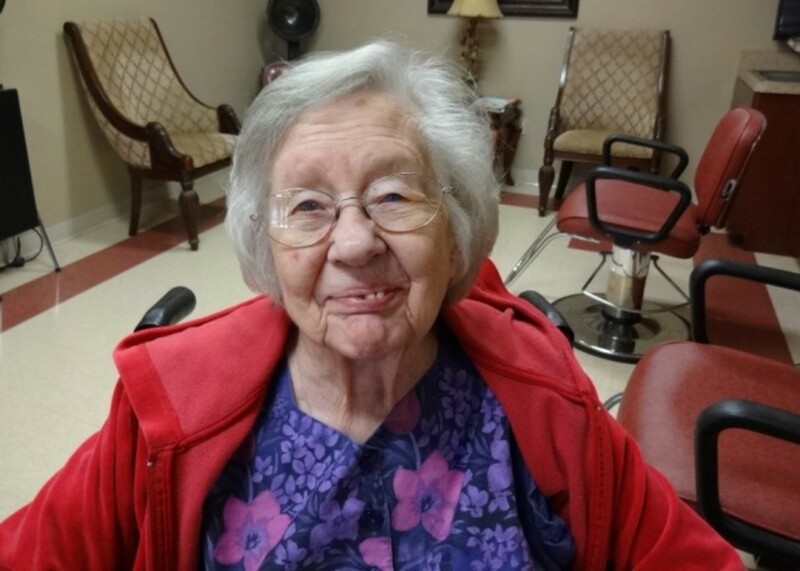 This resident has specific needs and a wish to fulfill them. 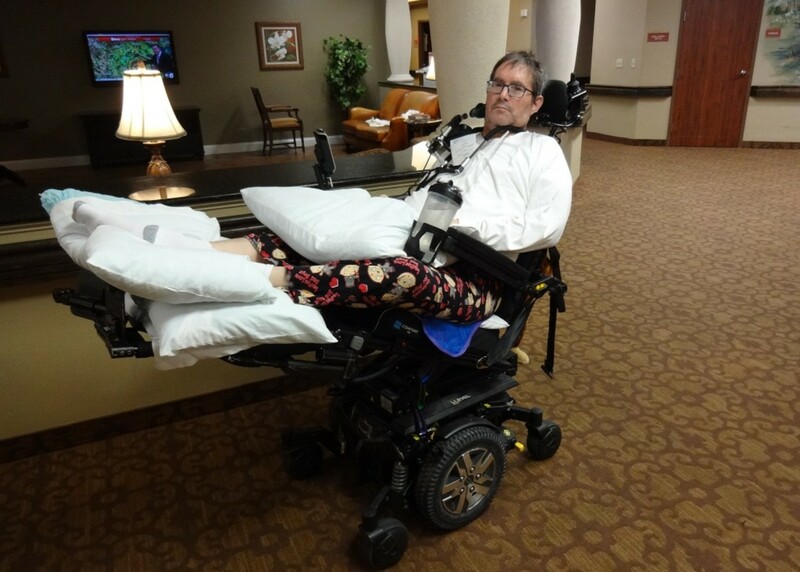 This resident was injured in an automobile accident and remains paralyzed. After eight years, he's experiencing a return of feeling to his legs. His wish is to have a couple of able-bodied people help him get up and down to his standing frame so he can stimulate his muscles. With proper exercise, he is confident that one day he will walk again and be able to feed himself. Wellness workers use other methods to engage patients like Aromatherapy and hand massages. With soft music playing and battery-powered candles, this therapy provides the much-needed physical touch from another human being that's often missing in facilities. 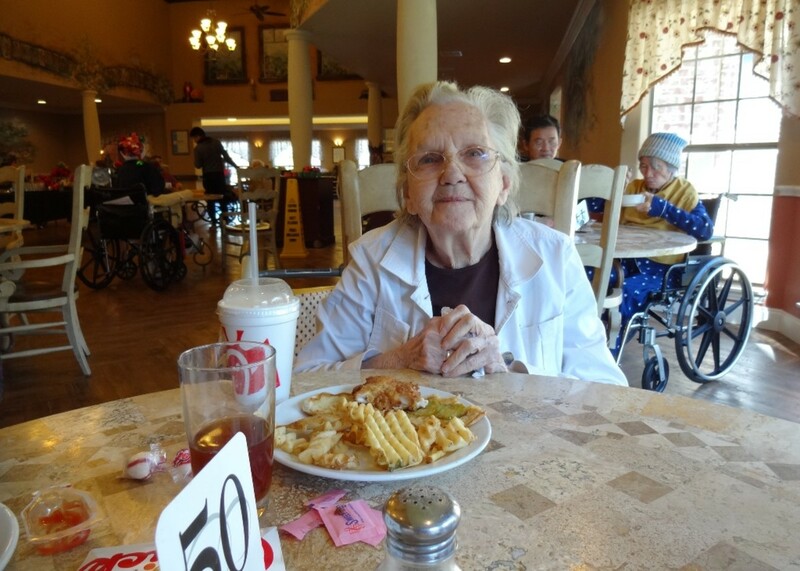 Time and distance permitting, it's nice to drop in and share a meal with your senior. 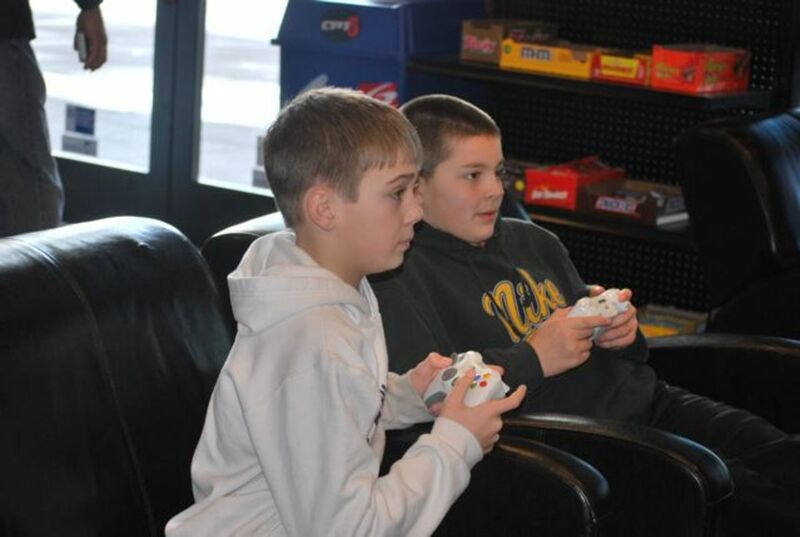 Stop by their favorite fast-food place and pick up take-out for both of you to enjoy in the lunchroom. A visit during meal time along with the pleasure of your company is one of the best investments you can make. For the small price of the food, they will benefit from your company and your presence will let them know they are loved and cherished. Here's wishing you all the best as you strive to keep your loved ones in mind and attend to their needs. What are some games that elderly people might like? Some of the folks like mentally stimulating games, like crossword puzzles, Scrabble, Sudoku (start with the easy levels to begin), picture puzzles, dominoes, and word association games. Visitors come to play card games like Rummy or Hearts, with their family members. Check with the facility administrator and see if you're allowed to bring a pet along. One family brought their parrot during visits. Others brought small, well-behaved dogs. It really lifts the residents' spirits to see their beloved animals. Sunshine, Bless you for your generosity and your care of those at your home. Where my mother stayed they put up an Angel tree with wish lists from the patients. Visitors could pick from the tree and fulfill the requests anonymously. Hope you have a Merry Christmas! i work in a nursing home. love it. 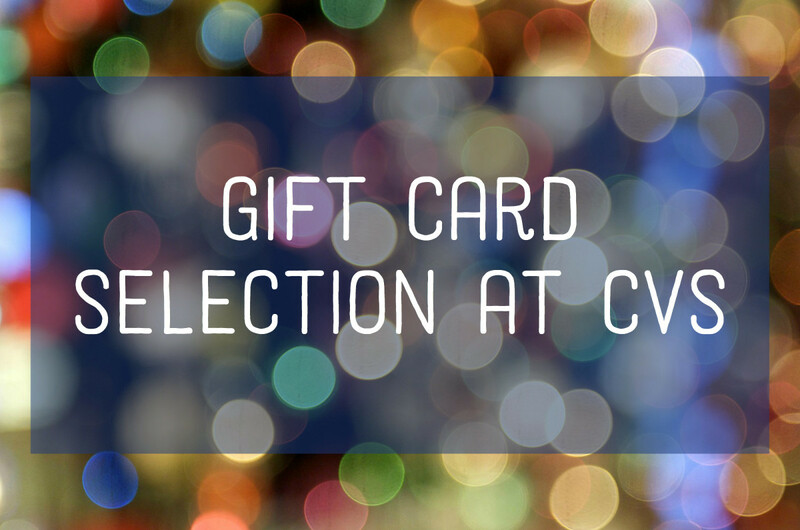 at Christmas time we pick a resident or two and get them a gift. Hi Poppy, Sorry to hear your grandparents are already gone. I was quite pleased when I visited Mom and her sister to find young people among the home schooled that visited and entertained at the home. The folks really loved their interaction and songs. What a wonderful hub filled with lovely ideas. All but one of my grandparents have already passed away so I don't have any relatives in nursing homes, but I found myself reading this article anyway for the heartwarming photos and nice gift ideas you have presented here. Great job. Thanks so much, Lisa Jane. I appreciate your visit and your thoughts. I love your article. It is full of great ideas. You are right though, what they want the most is time with their loved one. Thanks for coming by and for the kind words, rdsparrowriter. I loved these folks, they were like my family, we had so much fun together. They also have a wealth of knowledge of days gone by! Hello Margie, Bless you for all that you do and did for the seniors at your nursing home. Mom and Louise really got into the activities at the facility where they lived for over three years. It brightened their day to have someone remind them when games and events were about to start. I know what you mean about the age thing. I'm there, too. Hi, I was an activity director in a nursing home for many years and you are spot on with your hub! I have worked with elderly people most of my adult life. Now I am the elderly! Thanks for sharing is very informative information Peg. Dear Dream, So kind of you to visit this lady in her winter years. I love that she is still mentally with it and that she enjoys TV. 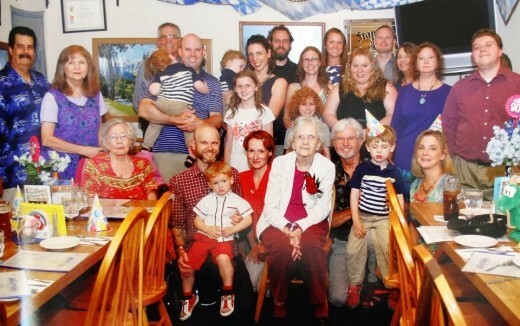 My Mother in the photos above with the walker was 92 in June. She passed in September 2017. 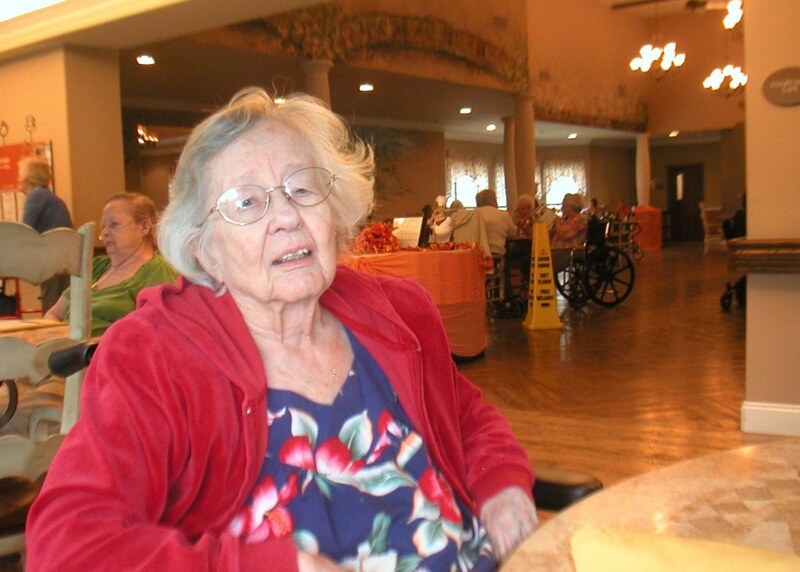 Her sister, Louise, in the video playing balloon volleyball, was sharp and remained witty at 97. She passed in October 2017. Their loss remains a large tear in my heart. Sorry about your mother. Kindest regards and God Bless. The woman who I visit is 95 and she doesn't leave her bed. I think she is so afraid of falling now I am afraid she is losing her strength in her legs and back. She can get bed sores and her mind is sharp as a tack it's her body that could still work. I don't know if she just got lazy and she stays in her room and watches t.v. Except when I am there, I say lets give it a rest. I make sure I turn it on before I leave. I am sure your mother couldn't wait till you got there and appreciated it so much. My mom passed away at 83. How old was your mom ? 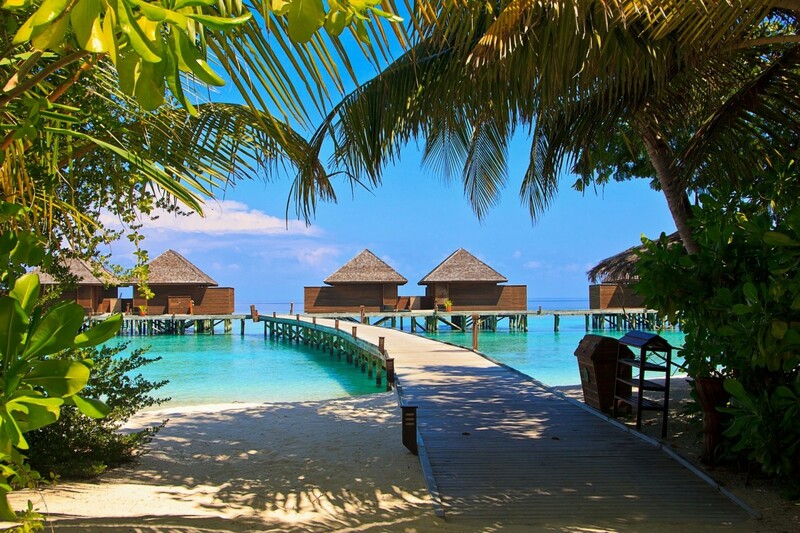 Dear Dream On, Your presence spending time with your family friend is the best gift you can give. I'm sure she enjoys it immensely and the talks and card games are special too. I found that my Mom grew to have less interest in games, TV or magazines and more interest in music and just sitting quietly together. We would attend the music performances of the home-schooled children and the activities director and sit and hold hands. She liked others to see that she was visited and beloved. Your hub was beautifully written. I spend a few days a week at a nursing home visiting a close family friend and I have asked myself the same question. What can I give her that she can enjoy and use. She shares her room with another women. Limited table top space. Flowers are nice. In the past I have brought her a quilted blanket and cards. I play the card game war with her. I make up imaginary games just to keep her thinking. Most of the time we spend talking and reminiscing about the good old days. Thank you so much for writing and sharing this much needed hub. Hi Margaret, You're right about the residents of rehabilitation facilities. Hours are long and time passes slowly when recovering from illness or injury. My husband had major surgery a few years back and found the time passed more quickly when he had his favorite magazines, like Hot Rod, Super Chevy and Car Craft. I appreciate your visit and insightful comments. Peg, these are such insightful ideas, not only for nursing home residents but also for rehabilitation facility residents. My late mother was in a rehab hospital for several months and she would have appreciated many of these gifts. 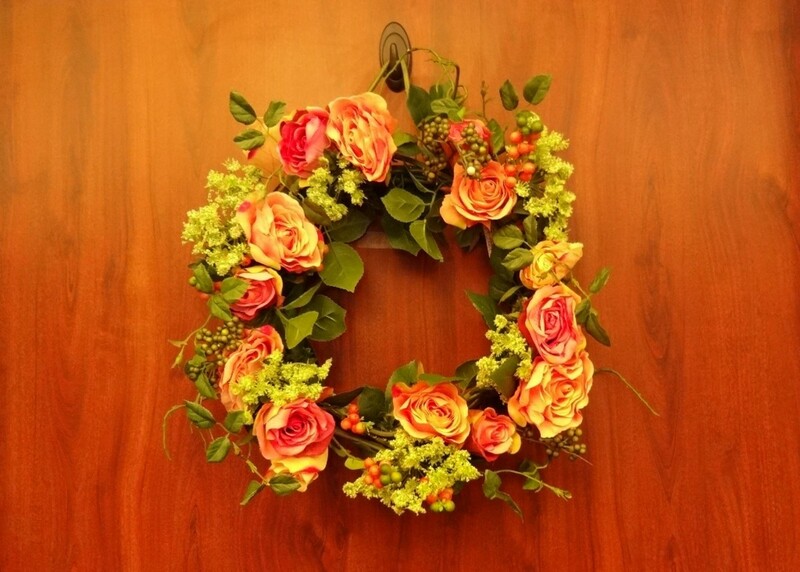 The idea of a dried floral wreath or door decoration to help residents find their rooms is brilliant! Hi Peggy, Thanks for coming by and for sharing the word about your sewing group. 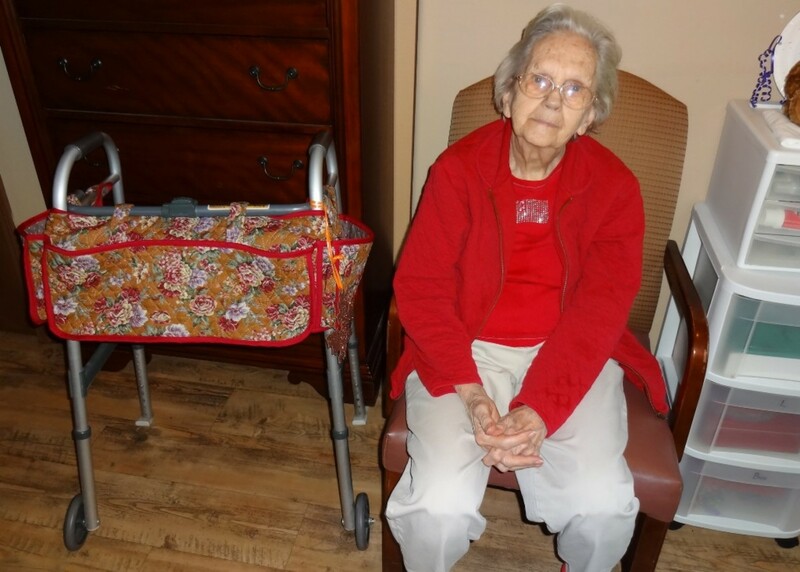 So many of the residents at the nursing home asked about the walker caddy and wanted to know where they could get one. What a great project for a group of volunteers to undertake. Mom carried her reading glasses, a small notebook, a pen to fill out the meal ticket, dog biscuits for the mascot at the home as well as tissues. These are such good suggestions Peg. You are correct that time is undoubtedly the most appreciated of all! I have a friend who is in a sewing group. They sew organizers that fit over walkers so that people in nursing homes can carry items like tissues and other things more easily with them. They donate them to nursing homes. They also sew things for children's charities. Thank you. I will keep searching for a group. These are great recommendations. Hello Rose Marie, Sorry, I don't know of any charity that sews wheelchair bags. It might be useful to suggest that to your church group or charity organization. Many churches have knitting circles that make mini-blankets for residents. My mom and her sister received several of them over their lengthy stay at a nursing home here in Texas. I sewed the walker organizer that is pictured with my mother above but it is a time-consuming and costly project. Does anyone know of a charity in eastern US that sews wheelchair bags for nursing home residents? Hi Frank, Thanks for taking time to stop in and for the important observation about gift giving. Bless you as well. Thank you, Chitrangada, for stopping in to read this and for the thoughtful comment. I sure do miss my Mom and her sister Louise. A wonderful and thoughtful article! You have been so close to these seniors, looking after them, so you speak with experience. Very useful information for those who want to buy or gift something to the elderly, so that they can use it and be happy to receive it. Thank you so much Nithya, for the visit and the kind remarks. 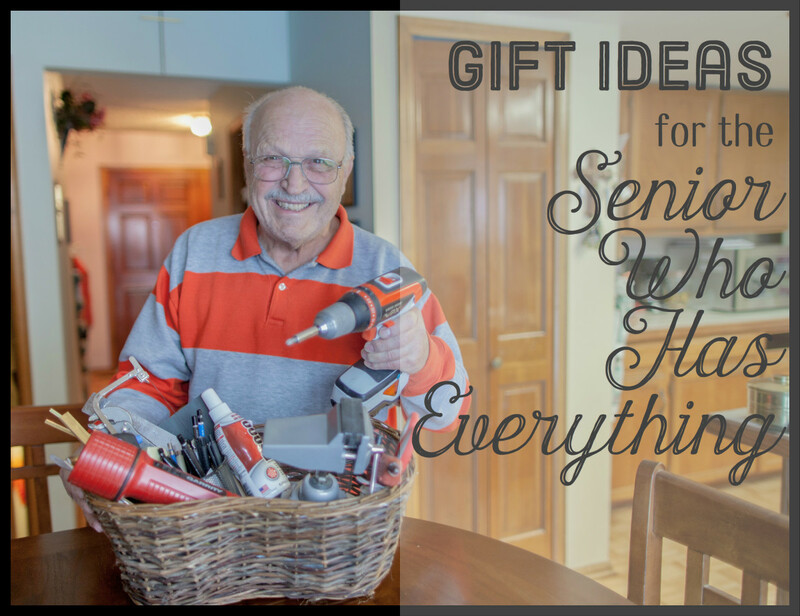 These are all great ideas for gifts for nursing home residents. I love the framed photographs of family members and spending time with them. Thank you Catherine. Looking back over these photos reminds me of the many years I had with my dear mother. Nice of you to drop by. You have done a wonderful service to both nursing home residents and the folks who love them. Everyone loves a gift, especially when it is useful and/or meaningful. I think the door decoration appeals to me the most. We all the know the gift of our time is the best gift, but when we can bring a little something when we visit, that makes the visit extra-special. Hello Linda, Thanks so much for taking the time to read this and leave such a thoughtful comment. Cheers to you. Hello dear Jackie, What a nice gift for your mom - a cuddly soft baby doll. Of course it matters when they are unable to vocalize or remember the names of their children. That is tragic and sad for us and for them in their private moments of reality. My heart goes out to you. My mom is in very poor physical condition right now - not eating - barely talking. It breaks your heart. God bless you and your family, too. Hello Mckbirdbks, Mike, thanks so much for coming by to read this and for your kind remarks. Seems like only yesterday that Mom celebrated her 90th birthday, yet it's been two years. Hope all is well with you and yours. I'm enjoying reading the stories in your new book, The Carriage Driver3 and can't help but think of them when I see the weathervane at the facility. Congratulations on another great publication. This is an excellent article, Peg. It contains so many good and kind ideas for helping seniors. Thanks for sharing all of the suggestions. Hi Flourish, How sweet of you to give your Great grandmother a manicure. And sharing that treat with the other residents was so kind of you. The bright colors would truly be cheerful. They have free nail painting at this facility and the residents so enjoy being pampered. Thanks for sharing that lovely idea here. Hello again Becky, Bunnies are so lovable, soft and fluffy. Included in my previous article about this topic were photos of the Visiting Dogs Association and the facility mascot, a golden retriever who comes to work every day with her owner, the Administrator. Ginger is well loved and known to all who live there. Her familiar bark makes them smile and say, "It sounds like home here." Last month, they brought in a miniature horse for the residents to pet and love on. I'm glad you were able to provide comfort to Dennis when he needed it most. Having a family pet visit is so important. My Mom asks about our dogs every time I'm there and tells me how much she misses them. Tony is over a hundred pounds and difficult for me to manage. Our other guy is a wild man and doesn't travel well. She tells me often, "I wish I had something to send home for the dogs." Hello Glenis, I loved hearing about your visiting dog. In my other gift ideas article there are photos of the visiting dog's association and the facility mascot, Ginger, a golden retriever. It's so true that the residents enjoy petting animals and having them visit. A couple of weeks ago they brought in a miniature horse! Thanks for the visit and kind comment. MsDora, thank you for dropping in and for the sweet comment. The video was taken a couple of years ago but Louise still loves playing balloon volleyball at 97. Hello Nell Rose, So kind of you to bring thoughtful gifts and necessities to your Mum when she was in a facility. The residents truly light up when they see they have a visitor. Thanks for coming by and for the great comment. My mom had a hard bodied doll at the nursing home someone had given her that she just loved but because it was hard I found her a bigger soft one she could cuddle easier and she did love it even more. Even though she said my name over and over she did not know who I was but of course that did not matter. I know personally how true all you say is. I think warm clothing is an excellent gift and very soft to be comfortable. Hello Peg - You have shared some good ideas, You also give us plenty of insight. Your family is such a strong unit. Coming from all over the world to share your Mom's 90th birthday just proves it. Flowers for the door is a great idea. You have helped a lot of people with these ideas. I like the puzzle and baby doll ideas particularly. When my great grandmother was in a residential facility many years ago, I would take a caddy with me to do manicures. I'd shape and paint her long lovely nails a hot pink or bright red or orange. It brought such joy that a few of her friends asked me to do it for them as well. It was a visual reminder that someone cared. Peg,the nursing home Dennis was in had a bunny for the people to pet and cuddle. They were also allowed to have a pet dog or cat visit once a week. Unfortunately., Dennis was in a respiratory unit where pets are not allowed. Between allergies and hair contamination with tracheotomies, pets were not allowed in that unit. We could take the dogs with us when we went, but they had to be in public areas. They had several public areas, away from respiratory, as well as a couple of courtyards. We had to have enough people with us to keep someone out in a public area with the dogs. They also had a couple of hamsters and quite a few birds. What a pleasure to come home from a weekend clinical rotation today and see your post. The pictures of our sweet ladies are beautiful. And the gift ideas you share are spot on. Hello Mary, Thanks for the wonderful comment and for your service to the population at the nursing residence of your in-laws. It takes a lot of heart to do that sort of work. I admire all the staff members who serve day after day in an environment that can be quite challenging emotionally and physically. Hi James, What a pleasure it is to see you here. Yes, most of the photos are of my mother and her sister. Aunt Louise is the one in the video playing balloon volleyball. Mom is the one with the walker caddy. So nice of you to drop in and leave a comment. Thank you. Hope that you are well. It sounds as if you really had all the bases covered with your thoughtful gifts for Dennis. My friend Hal, pictured above, was telling me the other day how much he loved to play cards. The cork board is a great idea for capturing all the greeting cards and daily activities lists that are received. I also liked the idea of the slip on wheelchair back cover. Before Aunt Louise got a custom wheelchair, the plain seat was uncomfortable. We found that a tie on dining room seat cushion worked and was easy to wash.
Again, thanks so much for the great comment and for dropping in here today. I know you miss Dennis so much. Hugs. Lovely ideas. I especially like the baby doll. Old people often don't have anyone or anything to cuddle. My cousin was allowed to take her dog into the care home when visiting her mother and she loved to stroke it. I think that is an idea that more care homes should adopt. These are all very thoughtful, practical gifts. I especially love the calendar. Louise is impressive at 95. Hi, what a great hub! I remember when my mum was in one, we were always taking her stuff in, and making sure they had entertainment etc. great idea for the doors, and yes a lot of the residents did forget their way! wonderful! Such wonderful ideas. I would never have considered some of the things on your lists. It is amazing to think that simple things such as the decoration for the door will help a resident feel more secure and not lost. The clothing choices I can understand and see how a lot has to be taken into consideration. The walker caddy must be a Godsend for residents who want to take items back and forth without having to ask a member of staff to do it for them. Many years ago, my in-laws had a nursing home and a residential home which I helped in occasionally. I wish I had thought more about how I could have made a positive impact on the resident's lives. Excellent article and full of good advice. A beautiful hub, Peg, thank you, and the lady in so many of the photos...your aunt? And Chris Lemoine--What a guy! This is a wonderful article Peg. I took Dennis a stuffed bear for an anniversary gift. He kept it on his bed to remind him of me. They often used it to prop his hand up, when his hand was getting sore. They had a cork board for their personal cards and photos. I posted all of the greeting cards for him to look at and I got him 8x10 photos of each of the families of his kids. He could not play card games, because he had limited mobility in his hands. He only got out of bed for an hour or two, because he got so tired, so didn't need to have a bunch of clothes taken to him. I took some cotton leisure pants with cartoon patterns. They were elastic waist and easy for the staff to help him into. He loved them and all the residents loved his Daffy Duck pants. I took him some inexpensive holiday decor to put on his walls and he had a small nativity that we put on the top of the dresser, next to his TV. I made a custom seat cover for the back of his electric chair. He had complained that it made him feel sweaty. I measured and cut it to slide over the back and it fit like a glove. The seat came with a couple of washable covers and I coordinated the back. Then they all wanted one. I made a couple more for some of the others.